Imagine what it would feel like to turn a corner out on some hiking trail and then suddenly see this amazing building in the distance. Like something out of a strange dream, the white walls seem to have grown right out of the sheer cliffs of the mountain. What a scary adventure it must have been for the people who hauled the materials up the mountainside and then build this place. And maybe even pretty scary for the people who live there now, those golden rooftops sit right under boulders that look ready to break off at any moment! When I first saw this picture I immediately thought it was some Buddhist monastery in Tibet, which ended up being a pretty close guess. 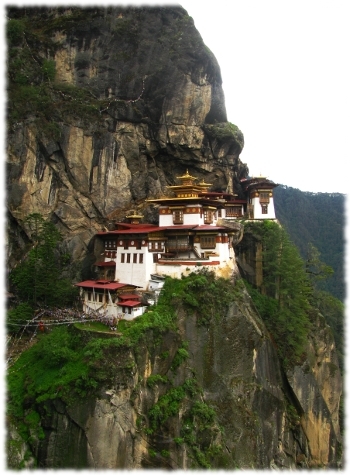 Turns out it’s a Buddhist monastery in Bhutan and is known as the Tiger’s Nest Monastery. The unusual name comes from a legend that says the founder of the monastery flew from Tibet to that spot on the mountainside on the back of a tigress. He then did some intense meditation in one of the caves there and afterwards emerged in 8 incarnated forms, making the site a holy place for Buddhists and devotees of the guru. I’m not sure exactly what 8 incarnated forms means but maybe that’s what you need to survive living on the edge of cliffs like that. I don’t have a magic tiger but I’d definitely visit that monastery if I had the change, if only just to see what it looks like on the inside and meet the people who live in such a magical environment.